No matter what you're after, Listers, we always deliver. And everybody needs a cheeky cheat meal every now and again (or more often than not). If you love #dirtyeating as much as we (not-so) secretly do, you'll love our list of 25 of the best fat feeds in Sydney. Leave your inhibitions and belts at the door – it's time to get down and dirty in a pile of greasy, sugary goodness. Salad can wait, you've got eating to do! 9. 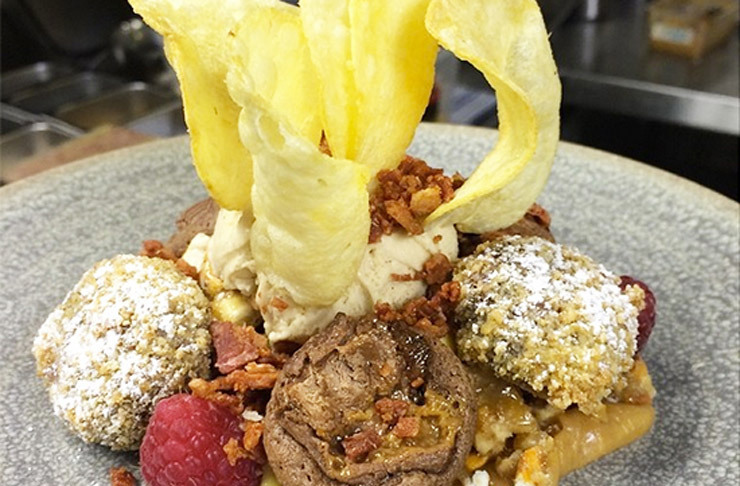 Ms G's, Potts Point - Stoner's Delight part 3: Doughnut ice cream, peanut dulce de leche, peanut & pretzel brittle, crispy bacon, Mars Bar brownie, potato chips and deep fried Nutella. 10. Harry's Café de Wheels, Woollomooloo – Harry's Tiger: Chunky lean beef pie with mushy peas, mash and gravy. 11. The Laughing Goat, Kogarah: Black Poison Thickshake: a whole chocolate brownie blended in! 13. Bavarian Bier Café, Manly: Bavarian Tasting Platter: Crispy pork belly, haus sausages, schnitzel, sauerkraut, red cabbage, creamy mash, granny smith apple compote and bier jus. 14. Braza Brazilian Barbeque, Newport - Traditional Churrasco: All you can eat meats! 15. Cowbell 808, Surry Hills – The Fat Stack Hotcake: Two ricotta hotcakes, marscapone, bacon ice cream, espresso caramel sauce and an optional side of bacon. 16. The Chef and the Barista, Neutral Bay – Nutella Doughnuts: Warm cinnamon donuts filled with gooey Nutella. 19. Una's, Darlinghurst - Deep fried camembert. 20. The Forresters, Surry Hills – The Nacho Double Dawg: A hot dog featuring two full-length tortilla crumbed smoked franks, chilli mince, guacamole and sour cream, with fries on the side. 21. Crown Street Fish Shop, Surry Hills – Battered and deep fried Mars Bar. 25. The Goni's Schnitzelria, Marrickville – The Aussie: A HUGE chicken schnitzel with ham, fried eggs, beetroot and cheese.